Want something that reminds you of warm days at the beach? The Ocean Waves scarf is just the accessory for you, and as always it’s a free pattern! I sat down to create this lovely wanting to do something very chic and different with the navy yarn and nothing was quite working until I started playing with spacing in my piece. That’s how the Ocean Waves scarf was born. 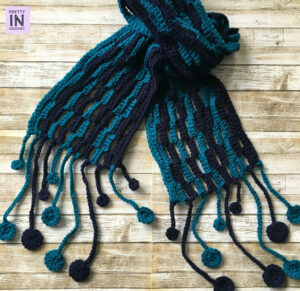 A combination of simple stitches, the chain stitch and single crochet, this piece was easy to work up and has turned out to be the accessory I never knew I wanted. To be honest, I am not always sure what my creations will look like exactly when I start, but when I think outside the box I get the best results. I love sharing my ideas with you, so this free pattern is one I hope you will love. It didn’t take long to realize that this dark yarn needed to be broken up with a brighter yarn. I dug through my stash not quite sure which yarn to use. It seemed almost best to play it safe and go with a boring old cream when I decided to just try the teal alongside the navy. 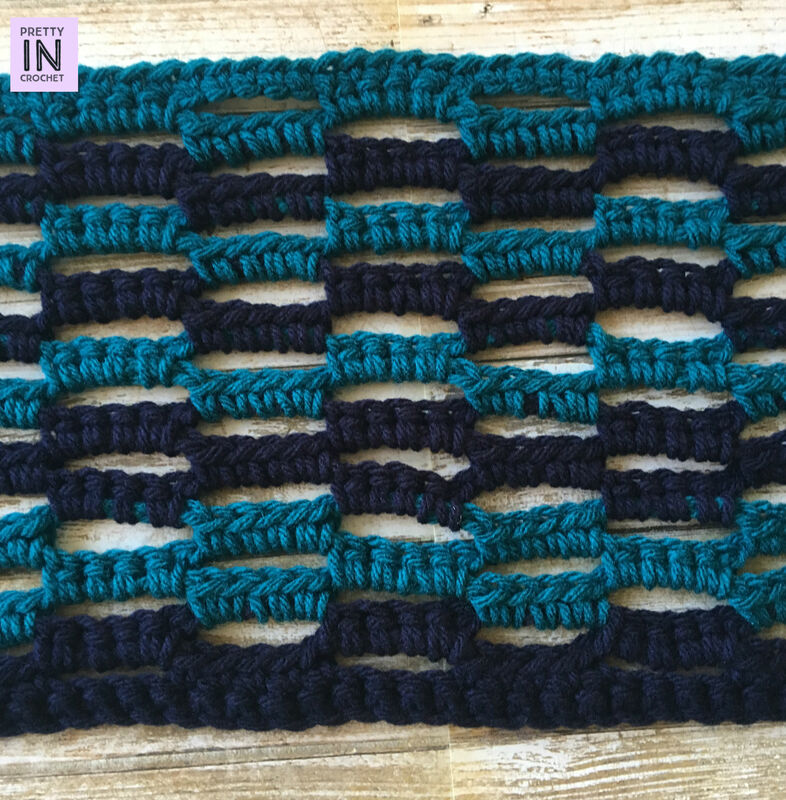 I started crocheting with the teal and was so glad I did! The colours that had seemed a bit odd when the skeins were placed together looked lovely once worked together. When in doubt, crochet a little and see what happens. Sometimes, it’s magic, like in the case of the Ocean Waves scarf. Loops and Threads Impeccable in Navy and Teal, one skein each. Row 1: Sc in second ch from hook and in ea across. Ch 1, turn. Row 2: *Ch 5, sc in 6th ch from hook rep from * across. Ch 1, turn. Row 4-6: Repeat row 2. Row 7-9: Repeat row 2. Row 10-11: Repeat row 2. Row 12-13: Repeat row 2. Row 14-15: Repeat row 2. Row 16-17: Repeat row 2. Row 18-19: Repeat row 2. Row 20: Sc in ea across. Fasten off, weave in ends. Round 1: Ch 1, sc 6 times into ring. Sl st into last st. Round 2: Ch 1, 2sc into each st around, sl st into last stitch. For the smaller tassels, do not crochet round two. Before finishing, chain varying lengths of chains of 15, 29 and 6 chains on to each tassel. Crochet 11 for each side (22 in total) and fasten on. Viola! You have a lovely piece, and I hope you loved this free pattern. It’s been a favourite of mine to create! I do recommend blocking this piece so that you get more of the open weave effect. To block acrylic yarn, lie your piece flat on a towel and stretch it gently to desired look. 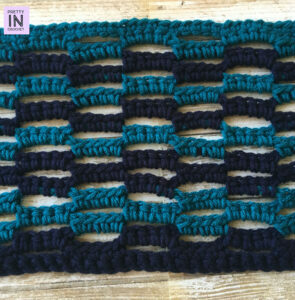 In the case of the Ocean Waves scarf, stretch it so you can see the open weave. Hold a steam iron about three centimeters above the piece so that the yarn is heated, and mist the piece from top to bottom. You do not want to ever press acrylic yarn or expose it to hot water or high heat from the dryer. It will melt and destroy your piece. This is a simple method to simply heat the yarn slightly so that it holds the shape you want. It’s the method I used and I found it easy and effective. 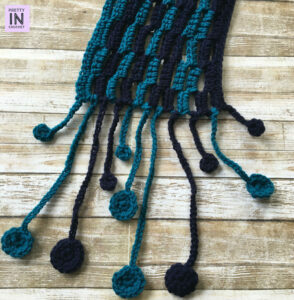 Have a lovely day crocheting the Ocean Wasves scarf. It was such fun for me to create and share with you. Be sure to subscribe to the blog to never miss a free pattern!